Giovedi 27 novembre 2014 Xing presenta a Raum il secondo appuntamento del focus sulla nuova scena performativa viennese commissionato da INTPA Austria e Tanzquartier Wien: Animal Jokes (For Animals), performance di Krõõt Juurak e Alex Bailey. (prima italiana). 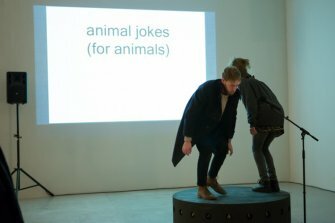 Animal Jokes (For Animals), performance di Juurak e Bailey, è il risultato di una ricerca sullo humor degli animali, di quelli domestici in particolare. Se l'antropologo Lévi-Strauss in Totemism (1962) conclude dicendo che “fa bene pensare con gli animali”, Krõõt Juurak suggerisce con questo lavoro che fa bene anche ridere con loro. Krõõt Juurak and Alex Bailey demonstrate the results of their research project on the subject of animal humor, focusing in particular on the humor of house pets. Anthropologist Lévi-Strauss stated famously in his Totemism (1962) that "animals are good to think with”. Maybe they are also good to laugh with.